Edit: Please note, this contest has now ended. You can view the results here. 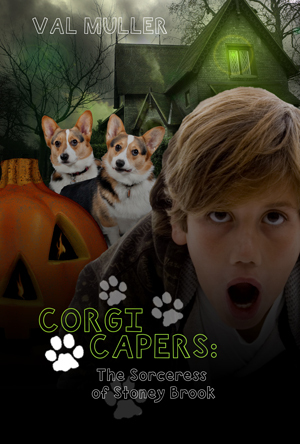 Congratulations to the winners, and look for Corgi Capers 3 soon! Happy Corgi-Versary! As part of the celebration, I’m offering the chance for two readers to name a character in the next book in the series. To enter, take the quiz below, which is based on events in the Corgi Capers series. The two readers earning the highest score will win! In the case of a tie, I will conduct a random drawing of those with the highest score. Winners will get to name and describe a character from the upcoming Corgi Capers 3. Each winner will also receive an autographed copy of the book when it is released. The first character is a feline. Many of the ideas from my book come from real-life events I experience with my corgis. But I decided even before I finished Book 2 that Book 3 would feature a cat even though my corgis had never really encountered a cat before. As if fate could read my mind, a cat has recently entered their lives. It began with a blue collar found stuck in the fence of our backyard. Then a cat started showing up in the drainage area behind our house. Now, taking the corgis for a walk means Cat Control. The corgis’ new purpose in life seems to be patrolling the area for signs of two cats—a grey and a calico. The winner of this contest gets to describe and name the feline character in Corgi Capers 3. While we’re talking cats, check out this free short story about the corgis and their discovery of a neighborhood kitty! The second character is Adam’s friend at the firehouse, where he volunteers. This can be a male or a female but should be close to Adam’s age (anywhere from 8 – 14 years old would be appropriate). Two winners will get to choose the name and description of a feline or human character that will be featured in the upcoming Corgi Capers 3. Winners will receive an acknowledgement in the book as well as an autographed copy (for US addresses only; International winners will receive an electronic copy). The book is meant for children ages 7 – 12, so final approval of names and descriptions will rest with the author and publisher. Names or descriptions that are incendiary, suggestive, or allude to people or characters of ill repute, or under copyright or other restrictions, or that are likely to create other problems, will be rejected, and winner may choose an alternate name and/or description. Contest is open to entrants 18 years of age and older. Children under 18 wanting to enter the contest must have a parent/guardian enter for them. Ready to Name the Characters? Take the quiz here, and be sure to enter your email and character names in the last question! Good luck! Posted on January 29, 2013, in character, corgi, corgi capers, Corgi-Versary. Bookmark the permalink. Leave a comment.